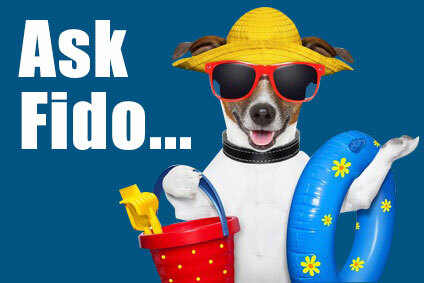 The only way you can be sure that Fido’s food is safe and healthy is if you prepare it yourself. Now nutritionist and chef Gayle Pruitt shows how easy it is to cook food to satisfy a gourmet’s tastes and be good for dogs as well. 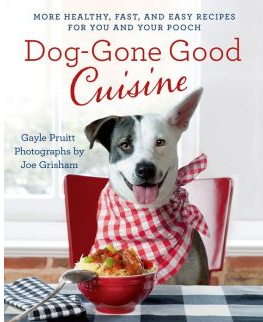 Her book, Dog-Gone Good Cuisine, offers more than 100 recipes that are corn-, sugar-, soy- and gluten-free. It skips ingredients harmful to dogs like onions, raisins and grapes without sacrificing flavor in healthy dishes like Salmon Florentine, Curried Beef Sliders, Beef Stew with Spaghetti Squash and Dirty Dog Rice. In a medium bowl, soak the bread in the chicken broth for a few minutes. Squeeze to remove excess moisture. Place the bread in a large bowl and , using your hands, mix together with the meat, egg, herbs, spices and salt. Form the mixture into 15 small balls. Brown the meatballs in a large skillet over medium heat. Thread three meatballs on each skewer and set the skewers on a baking sheet. Bake until just cooked through 15 to 20 minutes. Serve with yogurt and mint sauce. The most challenging part of this recipe was finding chicken broth without onions. If I’d had more time, however, I could have used one of her excellent recipes for homemade boney chicken, turkey or beef broth or homemade vegetable broth. The reception this dish got — both at the table and below — was all that a cook could wish. I served three humans and two dogs, all of whom were delighted. It was relaxing to cook once and feed everyone without having to prepare a second meal for the dogs. Preheat the oven to 175 degrees. Add the turmeric to a bowl of water, along with the chicken strips and let soak for about 20 minutes. Pat dry. Lightly grease a baking sheet with the coconut oil or place a lightly greased piece of parchment paper on the baking sheet. Place the dry strips on the baking sheet and bake for two to two-and-a-half hours. Transfer to a wire rack to cool. When cool, place in a plastic bag. The jerky will keep in the refrigerator for up to two weeks or in the freezer for six months. This was an enormous hit with Fido and the morning walking pack. Her tips on ways to use trimmings and parts of vegetables and meats that might otherwise get thrown away are thrifty and smart. The descriptions of the health benefits of various minerals, vitamins, spice and herbs are informative and helpful. The recipes cover a range from appetizers to soups to main courses to side dishes to juices and smoothies for both humans and dogs. The book really opened my eyes to foods that are healthy that I might not otherwise have considered feeding to Fido. Whether you want to supplement your dog’s diet with healthy treats and side dishes or feed him entirely homemade food, Pruitt provides recipes for that. She even offers recipes for raw food diets that are reasonable to prepare at home and can be adjusted for variety and changing seasons. The photos by Joe Grisham throughout the book are fun and charming and truly show off mouth-watering dishes. While this is a book I plan to consult often, it would also make an outstanding gift for a dog-lover who cooks.